Featured on our web site and in our monthly web catalogues are new and out-of-print books, documents, post cards, photographs, maps and charts, engravings, lithographs, uniforms and insignia, tools, lamps, lens apparatus, equipment and apparatus and much more relating to these heroic services. We now issue most of our catalogues on line rather than by mail. This allows us to issue more catalogues and feature more items, with better photos and descriptions. Let us know your email address and we will email you monthly as our catalogues are posted. See This Month's Catalogue Page now. Don't Forget Our Closeout Page - Up To 50% off regular pricing. Fresh items added Daily... Look at our Recent Items Page for the Latest Additions. 1686b. (BLU) The Finest Hours: The True Story of the U.S. Coast Guard's Most Daring Sea Rescue. BLU. $34.95. 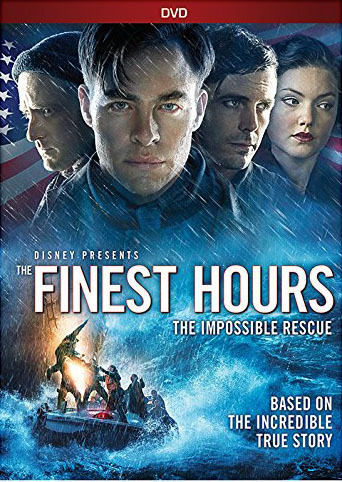 Disney's THE FINEST HOURS - a movie based on the extraordinary true story of the Coast Guard's greatest small boat rescue in history is coming to a movie theater near you early in 2016. A heroic action-thriller, “The Finest Hours” is the remarkable true story of the greatest small boat rescue in Coast Guard history off Chatham, Mass. 20209. 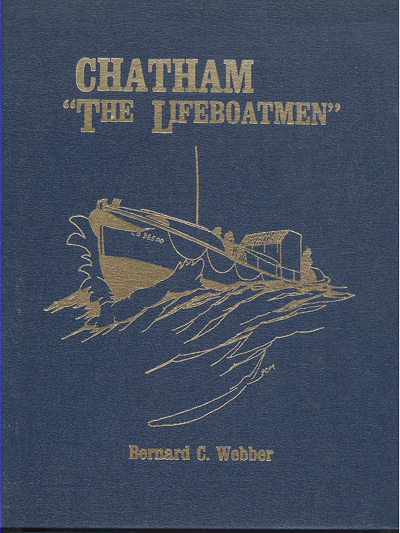 Webber, Bernard C., CHATHAM “The Lifeboatmen”. Orleans , Mass. 1985. 1st. 128p. Illustrated with numerous photographs. Late in February 1952, a northeaster swept New England with bitter cold, snow and gale force winds. East of Chatham 70-knot winds and 60-foot seas battered merchant vessels as the tankers SS Fort Mercer and SS Pendleton met the full force of the storm. They both broke in two on the morning of February 19th with 84 half-frozen men marooned on the battered hulks. The story of how these men were rescued is retold even today. 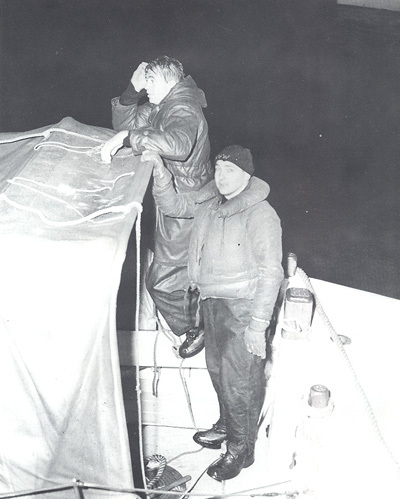 In the days following the ordeal, twenty-one Coast Guardsmen would be decorated. 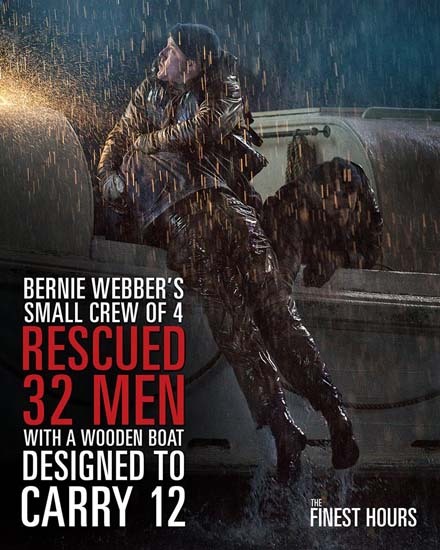 The men who ventured into 60-foot seas in the little 36-foot CG36500 motor lifeboat to rescue the tanker crews showed what heroism really is. 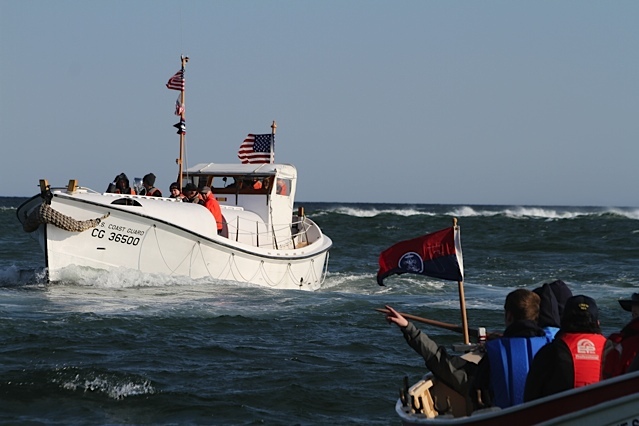 How this all came about, and the story of life at Cape Cod small boat stations in the 1950’s, is a tale well worth reading and a tribute to Coast Guardsmen everywhere. Wonderful reading. (M). $44.95. Special numbered edition with actual wood piece from MLB CG-36500. $59.95. 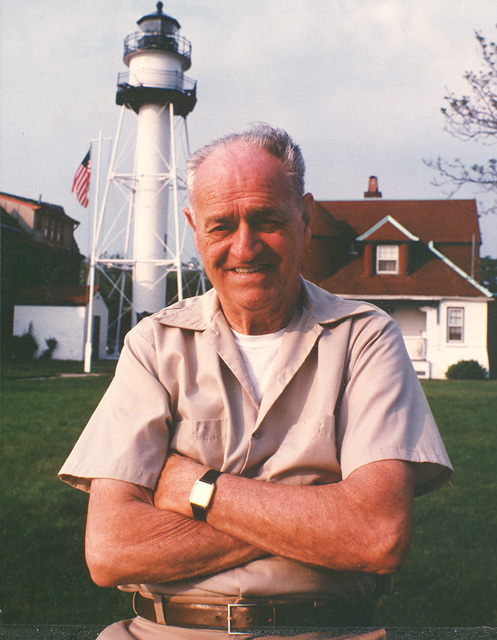 Watch Hill Light Station Keeper William Ivan Clark c.1970 – the last civilian keeper at Watch Hill, RI. With Keeper Clark is John Carter, who was with USCG, Group New London, from 1967 until 1971 and had the privilege of working with keeper Clark. Carter noted that “Keeper Clark and his wife Marion were great folks and treated all the Coast Guard crew like family! It was a great duty station.” Keeper Clark was in charge at Watch Hill from 1959 until his death in 1970, shortly after this photo was taken. Thanks to John Carter for this photo. 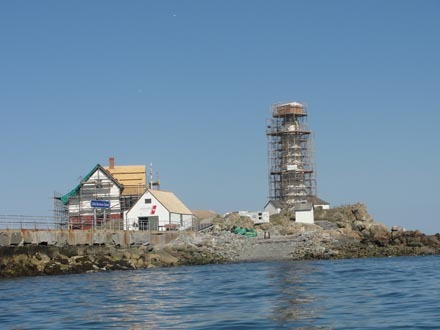 Work Continues on Upkeep and Restoration of Boston Light Station. Photo courtesy Coast Guard Keeper Sally Snowman. The $1.1 million project to repair and renovate structures at Boston Light began in May of this year. 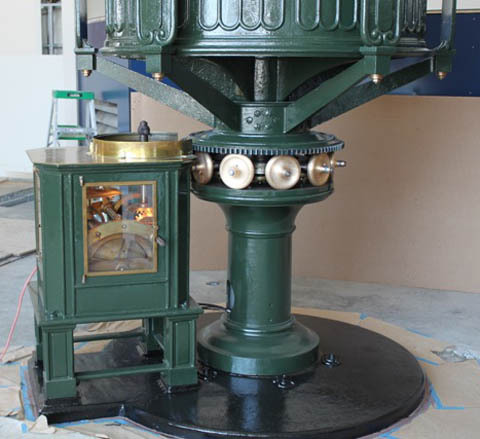 The project is intended to preserve the structural integrity of the lighthouse tower and surrounding buildings and assists in preparing for the light station’s upcoming tricentennial celebrations in 2016. The ongoing refurbishment plan includes an underground storage tank remediation, a new exterior coating to the lighthouse, new cedar roofs on all structures, new windows in the lighthouse keeper’s quarters, and painting of all structures. A new sewage treatment plant and temporary roof repairs have already been completed. Likewise, Work Continues by Owners Dave Waller and Family as they Lovingly Restore Nearby Graves Station in Boston Harbor. 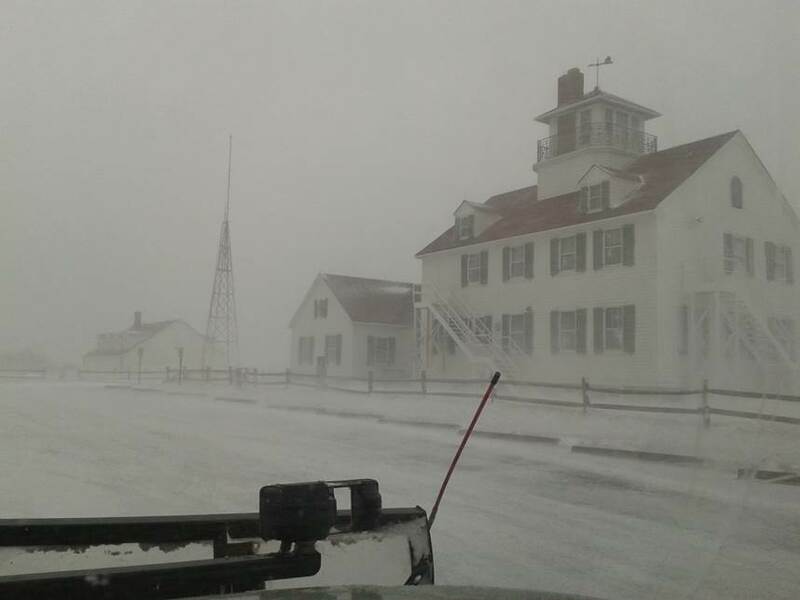 Blizzard at Nauset Coast Guard Station, Eastham, Cape Cod. Storm left 6-12" of snow, winds gusting over 75 mph. 125 years ago today, Joshua James and Hull's Massachusetts Humane Society volunteer crews began two days of tireless and continuous rescue work. In what came to be known as the Great Storm of 1888, Hull's volunteers, led by Capt. James, would save 29 men from five vessels. 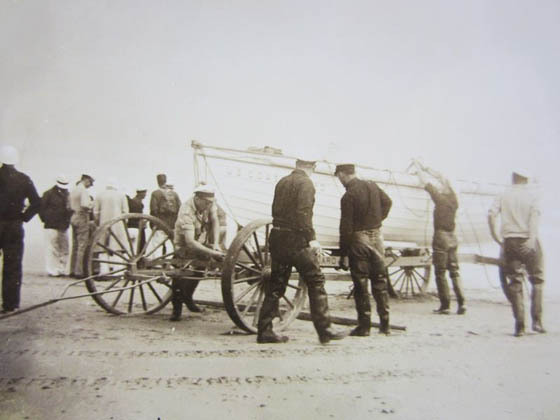 Visit the Hull Lifesaving Museum to see our Great Storm of 1888 exhibit, opening November 30th, and to learn more about these inspiring rescues. If you can, the Weather Channel on TV is showing a 1 hour documentary on the CG rescue of the crew from the Bounty last month. 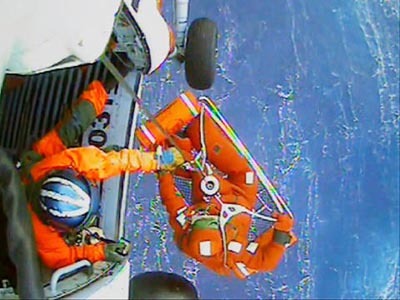 The entire rescue was filmed by cameras in the CG aircraft – well worth watching , spectacular scenes highlighting the heroic efforts by the Coast Guard rescue swimmers and air crews. They are airing it a couple times each day on the Weather Channel. Bass Harbor Head Lighthouse, Maine by Andrew Price. 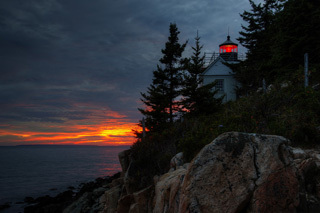 Lovely Fall photo of Bass Harbor Head Lighthouse at sunset by noted photographer and lighthouse historian Andrew Price. After turning the high, rusty-red crag, called Bass Harbor Head, where a squat little lighthouse, in white cassock and black cap, sits demurely looking off to sea, we see before us... a large cluster of islands, covering the approaches to a deep indent of the sea, over which the mountains bend down as if to shut it out from all intrusion. These are the Cranberry Islands... and that shut-in water is Somes Sound. -- Samuel Adams Drake, The Pine Tree Coast, 1891. For hundreds of vintage Maine lighthouse photos, books and more be sure to see our Maine page on our web site. 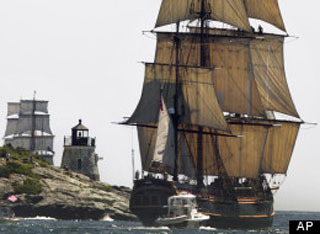 HMS Bounty, Ship From 'Pirates Of The Caribbean II' Abandoned By Crew During Hurricane Sandy - some Sailors Feared Lost. (AP) PORTSMOUTH, Va. -- The Coast Guard has rescued 14 members of the crew forced to abandon the tall ship HMS Bounty caught in Hurricane Sandy off the North Carolina Outer Banks. The Coast Guard is searching for two other crew members. It corrected the total number of crew to 16 from 17. Coast Guard Petty Officer 1st Class Brandyn Hill says 14 people were rescued by two Coast Guard helicopters about 6:30 a.m. Monday. The survivors were being taken to Air Station Elizabeth City on the North Carolina coast. The director of the HMS Bounty Organization, Tracie Simonin, said that the tall ship left Connecticut last week for St. Petersburg, Fla. She said the crew had been in constant contact with the National Hurricane Center and tried to go around the storm. For more information http://www.cbsnews.com/8301-201_162-57541911/hurricane-sandy-14-rescued-after-abandoning-hms-bounty-off-n.c-coast-2-still-missing/ . 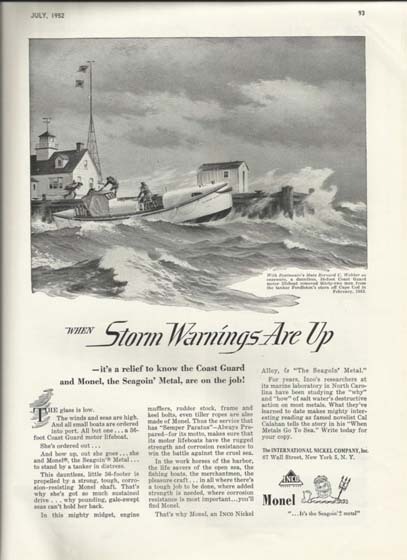 Read about the loss of the Portland and what would come to be known as "The Portland Gale" in our column Collecting Lighthouse Antiques in Lighthouse Digest Magazine, available now by subscription and on their web site at www.LighthouseDigest.com . For antique books, photos and artifacts from the Portland, visit our Antiques page on our web site. This week we again made our way to the famous Brimfield Antiques Show – A sure sign of spring. Since the 1960′s we have rarely missed a season (The show is held for ten days each in May, July and September each year.). Each show hosts tens of thousands of antique dealers over a one mile stretch of Route 20. Over 250,000 buyers spend the ten days searching for those items that they collect. Literally anything that you want to find can be found here. For myself, I look for Lighthouse Service, Life-Saving Service and early Coast Guard items. This week I was fortunate to find a wonderful album of early c.1880′s photographs and an early porcelain Lighthouse Service sign. I always come back with something great, and if I don’t, it is well worth the time enjoying the weather, talking (and haggling) with the antique dealers, and listening to others doing the same in a number of languages (Folks come from all over the globe to visit these shows each year. To see a few of the items that I found this trip, take a look at our Recent Additions page on our web site. 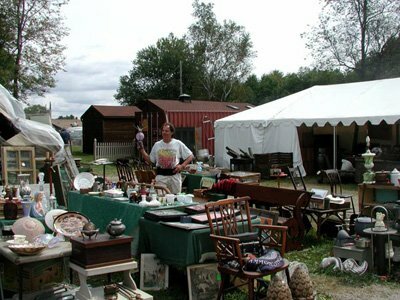 For more information on the three yearly Brimfield shows, check one of the many Brimfield Antique Show web sites. We spent last work at Race Point lighthouse - almost ready for the summer season. The solar hot water is working, as is the solar voltaic and wind power - we all should be considering such alternate clean forms of energy... and it is FREE. The piping plovers are again preparing their nesting spots this spring. We now have 4-8 nesting pair in the vicinity of the light station. It is wonderful to see these endangered birds coming back, though slowly and still in danger. 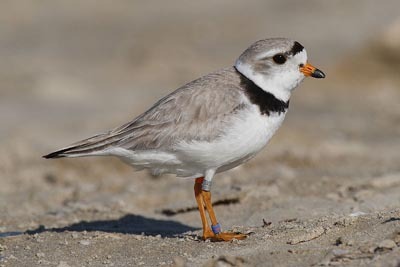 Piping plovers were common along the Atlantic Coast during much of the 19th century, but nearly disappeared due to excessive hunting for the millinery trade. Following passage of the Migratory Bird Treaty Act in 1918, numbers recovered to a 20th Century peak which occurred during the 1940s. The current population decline is attributed to increased development and recreational use of beaches since the end of World War II. The most recent surveys place the Atlantic population at less than 1800 pairs. We still need to take great care in protecting this and other species that we have hunted almost to extinction. For more information on our and the NPS efforts to protect the piping plovers and other species at Race Point, take a look at the American Lighthouse Foundation page "Teamwork Protects the Piping Plover and Keeps Access Open to Race Point Light Station". 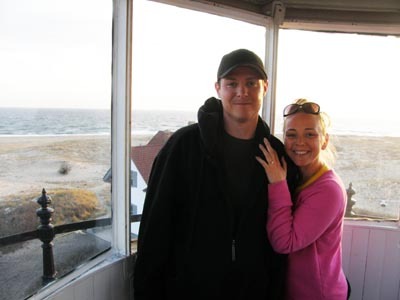 While there, a wonderful girl received an offer that she will never forget - and a beautiful ring too. And she said "YES". Congratulations to Renee and Ryan. 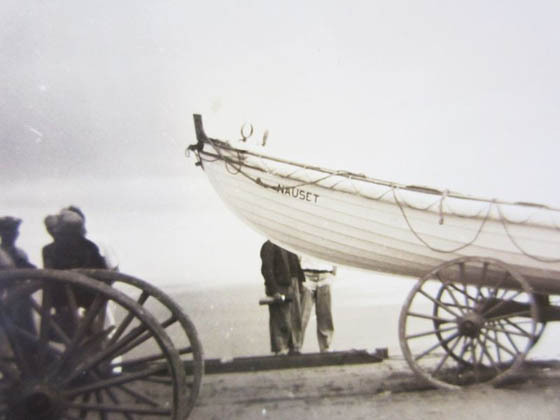 For more of this wonderful account of early life at one of Cape Cod’s Coast Guard stations, be sure to visit the web site of the Coast Guard Heritage Museum is located in Barnstable Village on Cape Cod, MA. The museum is open from May through October and houses one of the best collections on Coast Guard history in the country – well worth a visit if you are in the area. For early photos of this and other Cape Cod Life Saving and Coast Guard stations, take a look at our Cape Cod page on our web site. Do you know where this is ?. 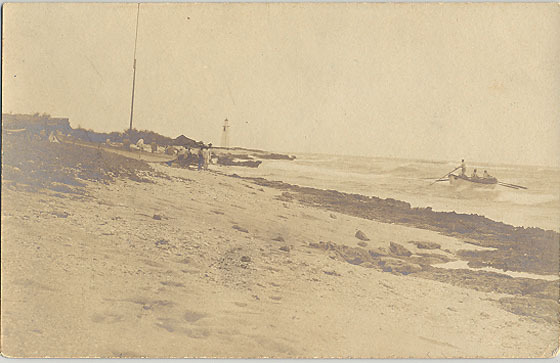 I recently picked up this c.1920-1930 photo of this unidentified U.S. lighthouse. Note the tall flag mast to the left. There is also a U.S. Life-Saving station nearby as evidenced by the surfboat crew launching for the daily drill. There is also another double-ended boat sitting on the dune top. Photo measures 3 1/2" x 5 1/2". The first person to identify this location and I can confirm it, this original photo is yours free. Historic Plum Island, Newburyport, Mass. I recently had the opportunity to visit Plum Island on the Massachusetts North Shore. The island contains a wealth of lighthouse and Life-Saving Service history and with a little searching there are wonderful sights to be seen. Plum Island, a nine-mile long barrier island off the northern coast of Massachusetts. 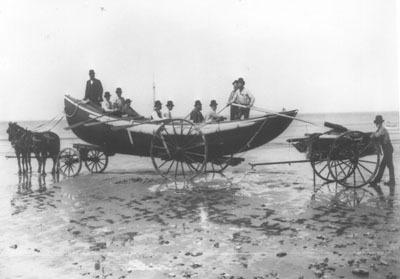 During its nineteenth-century heyday as a resort, steamships and a trolley line serviced Plum Island. 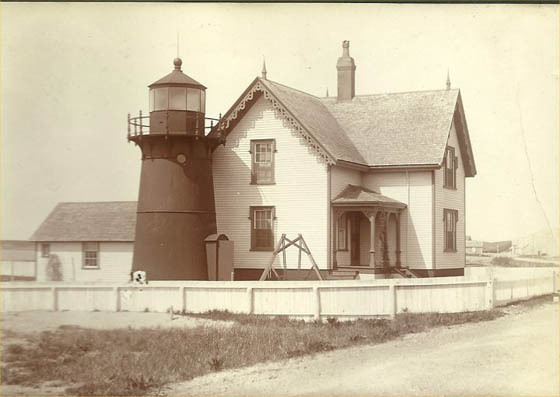 The present Plum Island Lighthouse was first lighted on September 20, 1898, probably the third or fourth lighthouse on this site. 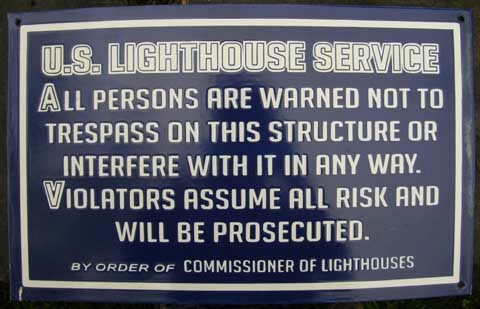 The lighthouse still exists and is worth the trip. The Friends of Plum Island Light continue to care for it under a lease agreement with the city. The keeper's house is used as housing for an official of the Parker River National Wildlife Refuge. Plum Island Light is easily reachable by car, and the lighthouse is sometimes open to the public on summer weekends. Another location worth searching for is the early Plum Island (Merrimack River) Life-Saving Station. Constructed in 1873-1877, this early 1874-Type station is one of only a few remaining in the country. Although it is now a private residence, you can recognize it by its Gothic and Stick Style architecture. It can be photographed from the street (please don't intrude on the owner's land) and is worth the trip too. Who knows what else you will find while you are searching for this station. For a number of wonderful early photos and books on the Plum Island stations, including PLUM ISLAND RECOLLECTIONS, (loaded with 80 never before published vintage photographs of the life of the U.S. life-savers on Plum Island - well worth the read) see our Recent Additions page. Moving the Old Harbor Life-Saving Station to Provincetown in 1977. 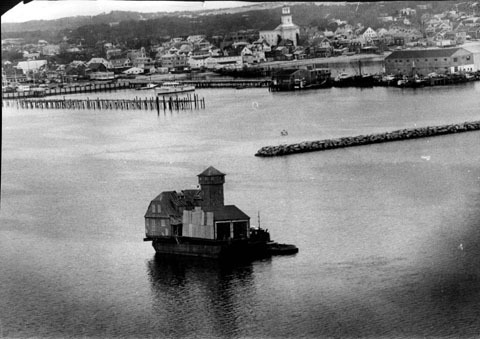 Moving the 1898 Old Harbor Life Saving Station by Barge in 1977. In 1977-1978 the National Park Service rescued the Old Harbor Life-Saving Station from the encroaching ocean on Chatham’s outer beach. 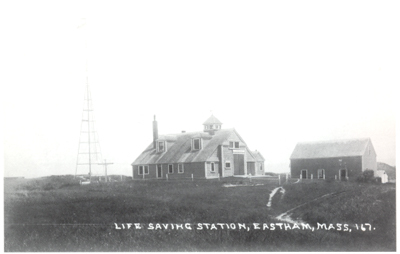 The station was built in 1898 and was one of thirteen life-saving stations on outer Cape Cod. The station was lifted by crane, in two sections, onto a barge and moved to Provincetown Harbor for the winter, 36 miles away. 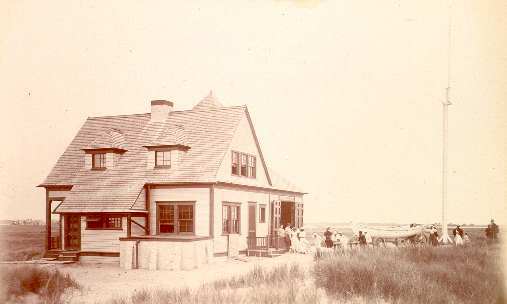 The following year the station was placed on a new foundation at Race Point Beach on the Cape Cod National Seashore and restored. Today the station serves as a museum on the U.S. Life Saving Service. This photo was taken on November 30, 1977 by M. Leo Tierney of the Boston Herald American. For this photo, books on the history of this station, and on Life-Saving Service history on Cape Cod and in other areas, check out our Life Saving Service page and our Cape Cod page. A great book is shown below. Mention this Blog page and receive a 10% discount on the price. The station will be open in another month for visitors - well worth the trip to see the exhibits, not to mention some of the best outer beaches in the country. Also, take a look at the NPS Old Harbor Life-Saving Station web site. 29313. Ryder, Richard G. Seashore Sentinel: The Old Harbor Lifesaving Station on Cape Cod. West Barnstable. 2009. 120p. Soft wraps. 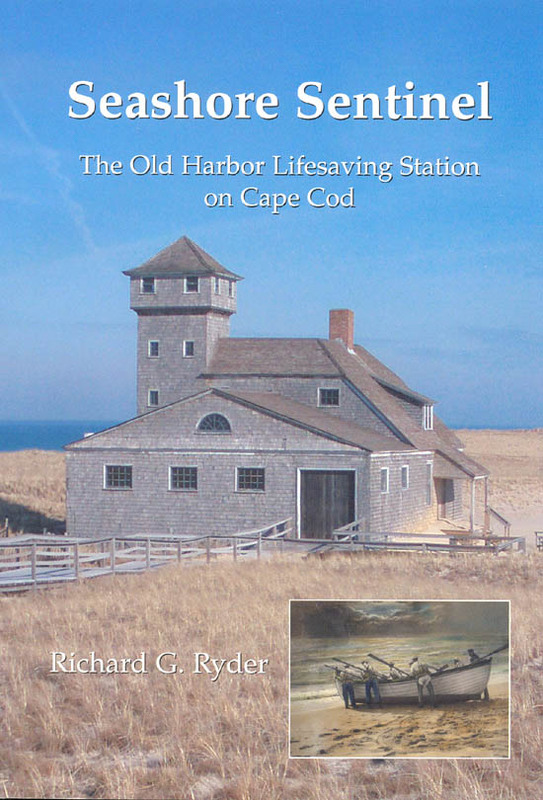 This latest account of the history and life at Cape Cod’s Old Harbor Life-Saving Station updates his older work - OLD HARBOR STATION CAPE COD – now long out of print but still in demand. This extremely worthwhile account of the life-savers at the Old Harbor Life Saving Station in Chatham , Mass., is a one of a kind, chronicling not only much of the wrecks and work of the life savers, but particularly looking at the equipment issued to such a station at the time and the lives of the men living and working there. Includes many photographs, wreck accounts, life at the station, moving the station and much more. A most interesting chronicle. (M). $12.95. Work to Begin at Whaleback Light Station. Bob Trapani, Jr., American Lighthouse Foundation (ALF) Executive Director, reports that there is one universal trait that shines brighter than any other in the lighthouse preservation field - the ‘can do’ attitude that is exhibited by so many of today’s modern day ‘keepers.’ Nowhere is this more evident than at offshore lights, especially those towers presiding over wave-swept ledges. Maine’s Whaleback Lighthouse, situated at the entrance to the Piscataqua River between Kittery, Maine, and New Castle, New Hampshire is one such place. The rugged 1872 sentinel is owned by the American Lighthouse Foundation and under the care of the organization’s local chapter, Friends of Portsmouth Harbor Lighthouses. 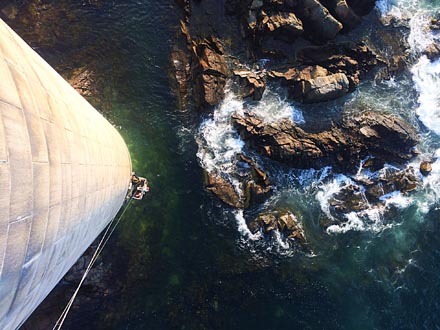 When it comes to offshore projects, getting there by boat, and coping with the vagaries of the sea at the same time are one challenge, but even when you get there, the act of disembarking volunteers and equipment raises a whole new set of difficulties. Rarely is there a day when the seas are calm enough to erase the difficulties associated with affecting a landing at this location, which is fraught with rocks and constantly impacted by powerful surges and some of the fastest currents in the world that flow in and out of the Piscataqua River. 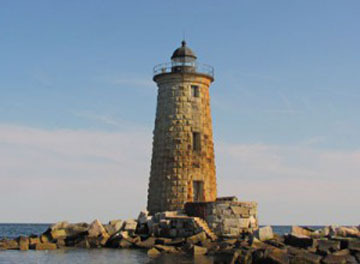 Given the realities at Whaleback, the Friends of Portsmouth Harbor Lighthouses have but one option if this beloved lighthouse is to be saved – to establish a safe and durable docking system at the site that can serve as a springboard for all things preservation and education thereafter. First, before establishing a boat landing and series of walkways / ramps at the lighthouse, the east and west stone breakwaters at the lighthouse must first be repaired. Over many decades, powerful storms have taken their toll on the breakwaters, slowly dismantled them. Today much of the stonework that once comprised these protective walls has been strewn about the site to the point where the original purpose of the breakwaters has all but been rendered ineffective. In order to repair the rock armor at Whaleback a marine company with a barge and crane – and ample experience with undertaking work at exposed locations, will be required. Once the American Lighthouse Foundation obtains the approval of the Maine Historic Preservation Commission, work at the site is expected to begin not long thereafter. But of course, like all things at Whaleback Light, weather and seas will have a lot to say about things before all is said and done! For more information on their plans and photos of this daunting light station sight, take a look at the ALF Whaleback Light Station web site. Stay tuned too for exciting updates on this project over the coming year. 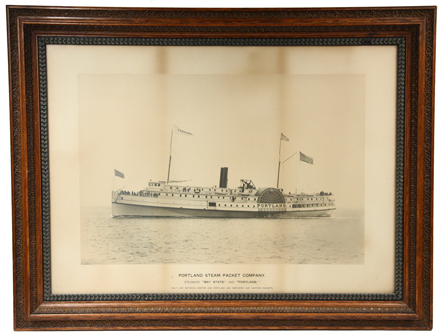 For antique photos and other information on Whaleback Light Station, take a look at our Maine Items web page . The North Atlantic right whale, among the world’s rarest mammals, has returned to Provincetown waters weeks ahead of schedule and in stunning numbers, likely drawn by the unusually warm waters after a historically mild winter. The waters off New England this month are about 5 degrees warmer than in past years. "All of nature is ahead of itself,’’ said Michael Moore, senior research specialist at the Woods Hole Oceanographic Institution. Such sightings don't usually occur in the Provincetown area until mid-April, when as many as half of the world's population can venture into the area following food supplies. 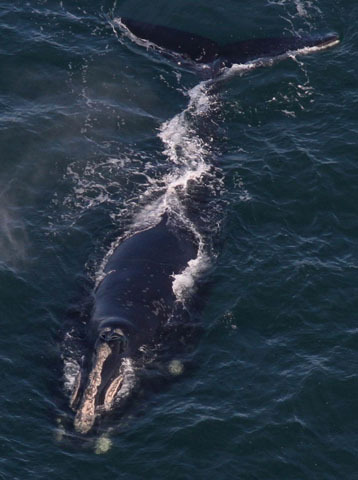 The Boston Globe reminds us that there are only about 475 North Atlantic right whales left in the world, and many gather each spring in the rich feeding grounds of Cape Cod Bay, drawing crowds of onlookers with their acrobatic breaches. But this winter, researchers first spotted the enormous creatures in mid-December, and have since identified almost three dozen more. With each new sighting, some within 300 yards of shore, scientists have grown more amazed. 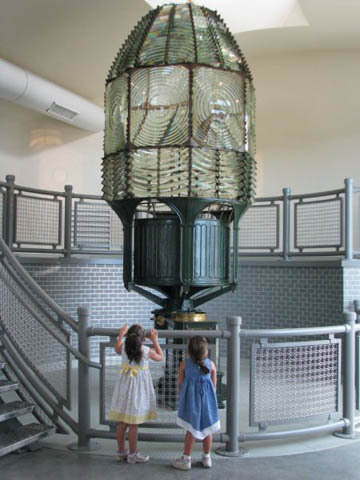 The Fire Island Light Station recently had their original First Order Fresnel Lens and clockwork rotating mechanism returned, and both are currently on display in their new lens building. However, the clockwork is missing the handle that would wind the cable. We wonder if any readers might have any idea where they could locate a handle? The owner reports that as of mid-February, LV-112 is in dry-dock, nearing completion of Phase 1 of hull restoration. 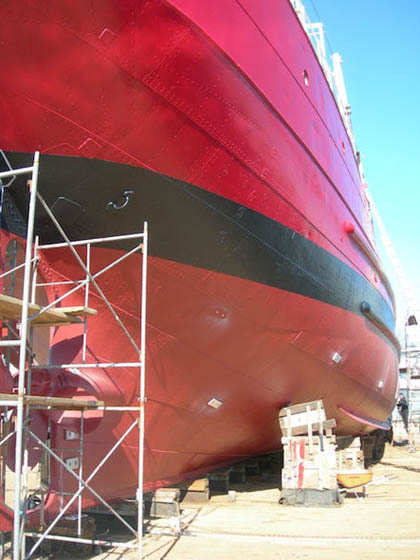 The crew at Fitzgerald Shipyard are doing a great job and progressing well. 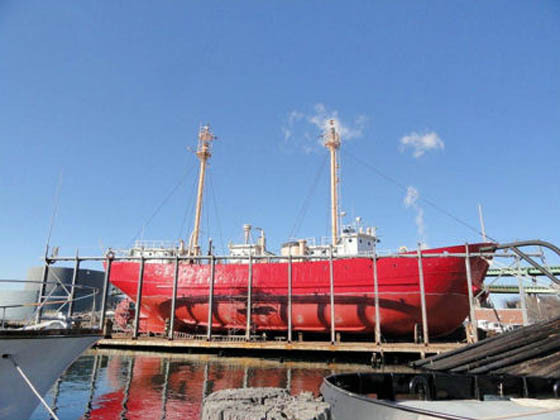 The historic ship now has several coats of high quality two-part epoxy industrial marine coatings painted on her hull's exterior. Before applying the coatings, LV-112's hull was cleaned, sandblasted, inspected and repaired. Most of the marine coatings were generously donated by Sherwin-Williams / Seaguard Marine, Industrial Marine Coatings Division. John Bouthillette, the dedicated marine representative from Sherwin-Williams, was a tremendous help in securing this donation and guiding the process for preparing and applying the coatings. Phase 2 of LV-112's restoration, to be performed by Amex, Inc., of East Boston, will be the entire weather deck, deck houses and superstructure. 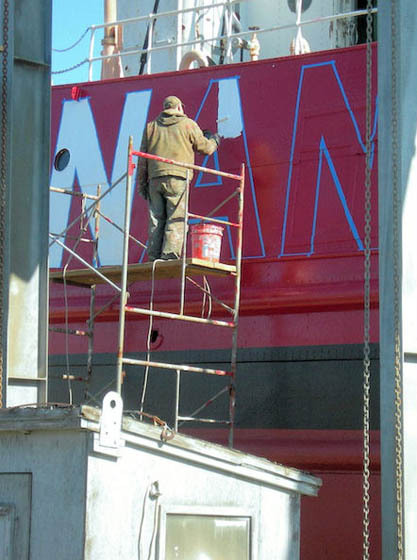 He hopes to have this portion of the ship's exterior completed by summer 2012. 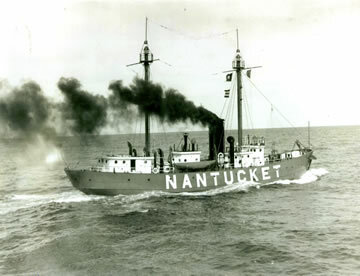 For more information on the progress of the restoration, check out the Nantucket Lightship/LV-112 web site. For more great restoration photos, take a look on the U.S. Coast Guard Lightship Sailors Association web site. 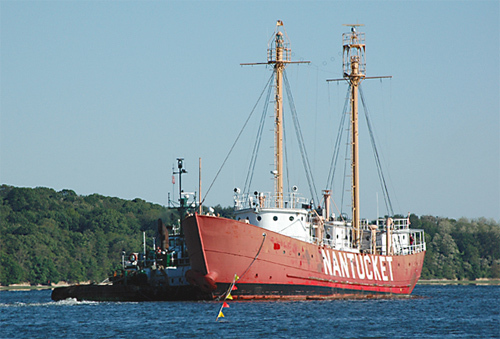 For more historical information and antiques from U.S. lightships, take a look at our Lightships page. Late in February 1952, a northeaster swept New England with bitter cold, snow and gale force winds. 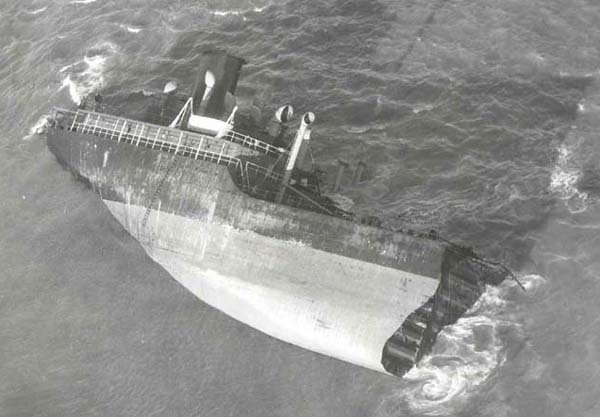 East of Chatham 70-knot winds and 60-foot seas battered merchant vessels as the tankers SS Fort Mercer and SS Pendleton met the full force of the storm. They both broke in half on the morning of February 19th with 84 half-frozen men marooned on the battered hulks. Four Coast Guardsmen set out from Cape Cod during a fierce storm in a seemingly impossible quest to locate and rescue the crew of the damaged tanker Pendleton. They returned as heroes. BM1 Bernard C. Webber, coxswain of motor lifeboat CG-36500, from Station Chatham, Massachusetts, and his crew of three headed out over the dreaded Chatham [sand] bars toward the stricken tanker Pendleton. Webber maneuvered the 36-footer under the Pendleton's stern with expert skill as the tanker's crew, trapped in the stern section, abandoned the wreck of their ship on a Jacobs ladder and, with the aid Webber's crew, made their way down and into the Coast Guard motor-lifeboat. Webber and his crew of three, EN3 Andrew Fitzgerald; SN Richard Livesey; and SN Irving Maske, saved 32 of the 33 Pendleton's crewmen who were on the stern section of the ship that night. All four Coast Guardsmen were awarded the Gold Lifesaving Medal for their heroic actions. 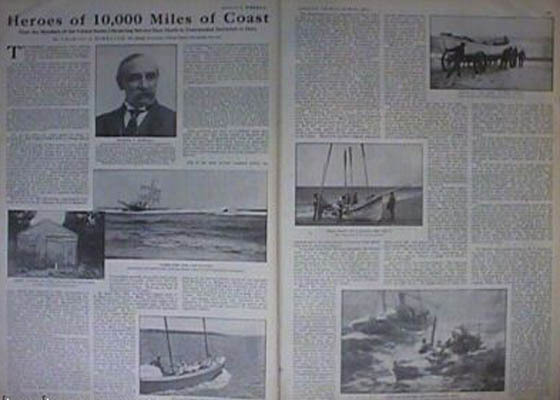 Their successful rescue operation has been noted as one of the greatest in the history of the U.S. Coast Guard. Wednesday, Feb. 15, 1-3pm, U.S. Coast Guard First District Headquarters, Base Boston, 427 Commercial St., Building No. 1 (function hall). 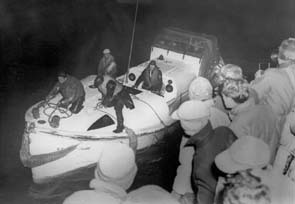 Anniversary celebration of the famous Pendleton/Fort Mercer rescues on Feb. 18, 1952, off the coast of Chatham. Among several displays, the event will feature exhibits from the USCG Heritage Museum (Cape Cod) and the U.S. Lightship Museum (LV-112). Open to general public. 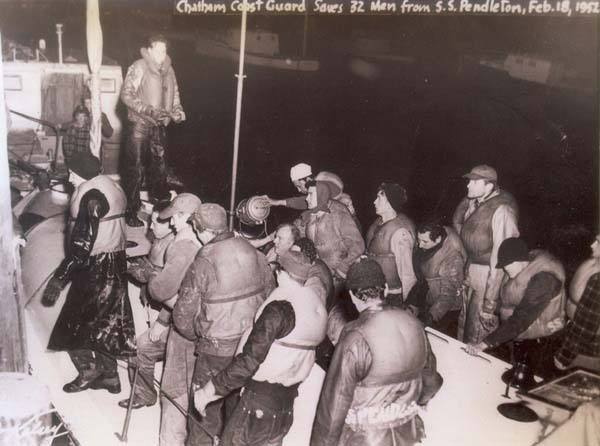 Saturday, Feb. 18, 12-4:30pm, Coast Guard Station Chatham, Open House, 60th Anniversary of Pendleton/Fort Mercer Rescues. Guest speakers, imagery, artifacts; meet people involved in the rescues. Open to general public. Saturday, Feb. 18, 6pm, Chatham Bars Inn, Chatham. Dinner titled "Tales from the Sea." Dining and lecture on the 60th anniversary of the Pendleton/Fort Mercer rescues. Kicks off with a champagne reception, followed by a sumptuous three-course dinner and lecture by Casey Sherman, co-author of "The Finest Hours," the story behind the rescue (see book details on our Cape Cod web page) The dinner is $65 per person; reservations required; call 508-945-0096. 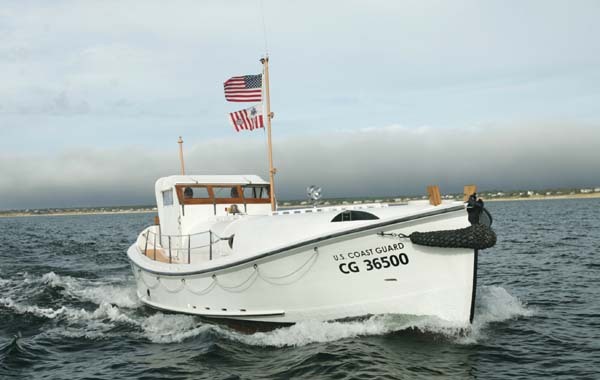 For more information about the CG-36500 - the Coast Guard motor-lifeboat that was used that night and its restoration take a look at their web site CG-36500. 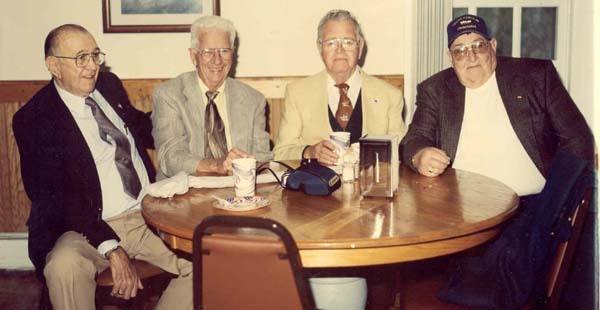 At the 50th Anniversary of the Rescue: The crew of the CG-36500 -Bernard Webber (deceased), Andrew Fitzgerald, Richard Livesey (deceased) and Irving Maske (deceased). 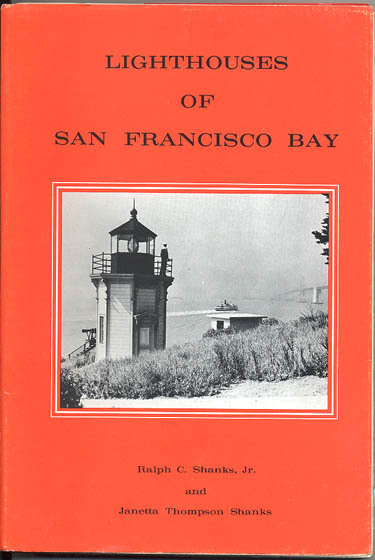 We just picked up a hard-to-find book from the author Ralph Shanks: LIGHTHOUSES OF SAN FRANCISCO BAY. (1976. 1st. 123p. Soft wraps.) 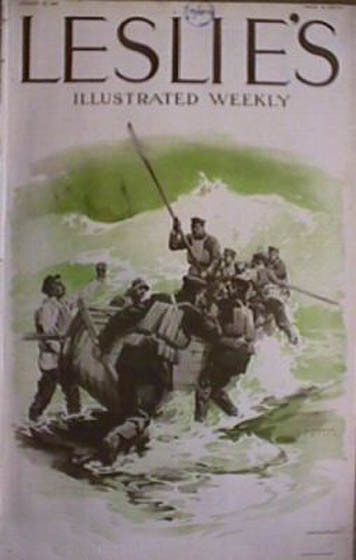 “...Climb the iron stairways of San Francisco Bay ’s lighthouses to re-light the ancient lamps...on the beach below, the rescue boats are being readied...more watches...more beaches to patrol....” All of this well known author’s original stories are here, along with a rich treasure of countless new adventures. Illustrated with over 65 vintage photographs, the Shanks’ wonderful work chronicles the work of San Francisco Bay ’s Light Keepers as never before. Light stations includes Alcatraz Island, Yerba Buena, Point Bonita, Fort Point, Mile Rocks, Lime Point, Angel Island and Point Blunt, East Brother, Mare Island, Roe Island, Oakland Harbor, Southampton Shoal, Carquinez Strait, and more. Wonderful reading. Library copy but with a new dust jackets from the author, we have had these re-bound. Extremely difficult to find this early West Coast Reference and well worth the price. Also Signed by the author. (VG). Regularly $38. Reduced $26. See our Recent Additions page. Soon too we will be back at Race Point getting cleaned up and painted from the "winter", ready to host guests for the spring and summer. About half of the dunes that you see in this photo have been lost to the sea in the last four years. We are now about 200 feet from the beach. I will keep you posted of the changes that have occurred over the winter. Anyone who truly enjoys reading of the life of a lighthouse keeper, or of the charm of Cape Cod, should surely read Henry David Thoreau’s account of his visit with the keeper of Cape Cod (Highland) Lighthouse, and his walk from Eastham to Provincetown in 1849 and again in 1855. In this renown work, Thoreau records his adventures and sights as he trekked the outer beaches, and the humor of the “local, self-reliant folk”. 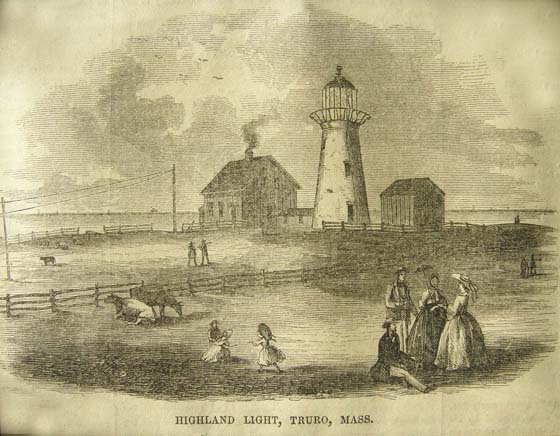 Thoreau first published his account of his visit with the light keeper (possibly Keeper James Small (1843-1849 and 1853-1856), in The Atlantic Monthly as “The Highland Light” [Vol. XIV. December 1864, pp. 649-659]. Later, in 1865, he published the complete account of his Cape Cod treks under the title “Cape Cod” In it, Chapter VII included his account of his stay at Highland Lighthouse. “….To-day the air was beautifully clear, and the sea no longer dark and stormy, though the waves still broke with foam along the beach, but sparkling and full of life…. The sun rose visibly at such a distance over the sea that the cloud-bank in the horizon, which at first concealed him, was not perceptible until he had risen high behind it, and plainly broke and dispersed it, like an arrow. But as yet I looked at him as rising over land, and could not, without an effort, realize that he was rising over the sea. Already I saw some vessels on the horizon, which had rounded the Cape in the night, and were now well on their watery way to other lands…. We struck the beach again in the south part of Truro. In the early part of the day, while it was flood tide and the beach was narrow and soft, we walked on the bank, which was very high here, but not so level as the day before, being more interrupted by slight hollows…. Thus we kept on along the gently curving shore, seeing two or three miles ahead at once…. We saw this forenoon a part of the wreck of a vessel, probably the Franklin, a large piece fifteen feet square, and still freshly painted. With a grapple and a line we could have saved it, for the waves repeatedly washed it within cast, but they as often took it back…. This light-house, known to mariners as the Cape Cod or Highland Light, is one of our "primary sea-coast lights," and is usually the first seen by those approaching the entrance of Massachusetts Bay from Europe. It is forty-three miles from Cape Ann Light, and forty-one from Boston Light. It stands about twenty rods from the edge of the bank, which is here formed of clay.… It rises one hundred and ten feet above its immediate base, or about one hundred and twenty-three feet above mean low water…. Even this vast clay bank is fast wearing away. Small streams of water trickling down it at intervals of two or three rods, have left the intermediate clay in the form of steep Gothic roofs fifty feet high or more…. I hope that this brief introduction to his work may encourage you to find a copy of Thoreau’s “Cape Cod” and to read further. This is a truly important account, and a must if you are interested in the shipwrecks, lighthouses, life-saving and life as it existed for residents of outer Cape Cod in the mid-1800’s. 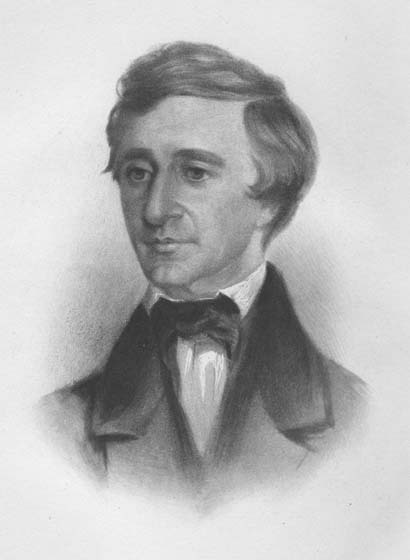 We have this and other of Thoreau’s works available on our Cape Cod web page. In April of 1946 historian and author Edward Rowe Snow began a similar hike around the “bended arm” of Cape Cod, as Thoreau called it, in an effort to trace, in as many cases as possible, Thoreau’s route and the locations where he stopped. Although others have attempted to duplicate Mr. Thoreau’s trek, I suspect that Mr. Snow is one of the very few who came close to duplicating the difficult walk through the deep sand of the outer beach. For portions of Snow’s account and for hours of wonderful reading, you will want to read one of his earlier books as well: “A Pilgrim Returns to Cape Cod” [Boston. 1946]. See this and others of Mr. Snow’s works, on our Edward Rowe Snow web page. 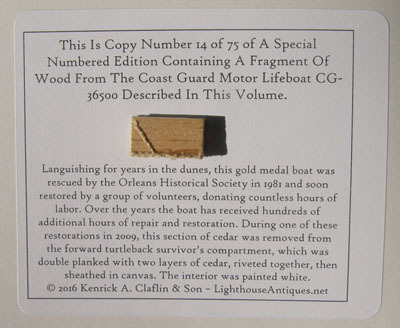 For more too, you may want to read our monthly column entitled Collecting Nautical Antiques in Lighthouse Digest Magazine. We just got in some wonderful photos of Keeper Frank Schubert at the Coney Island Light Station. The crystal clear photos show Keeper Schubert, last civilian keeper at Coney Island Light Station. Keeper Schubert began his lighthouse career in 1938 aboard the buoy tender Tulip. He followed that with time at the offshore Old Orchard Lighthouse, and then was assigned to the Army Transportation Service during World War II. 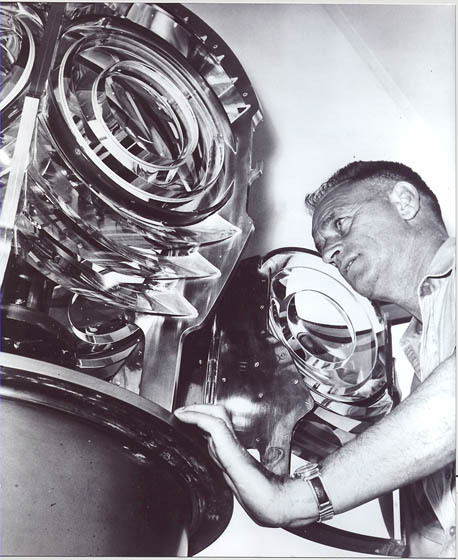 After the war, he served as the keeper of three lights at Governors Island. While stationed there, his wife, Marie, and their three children lived on Staten Island. 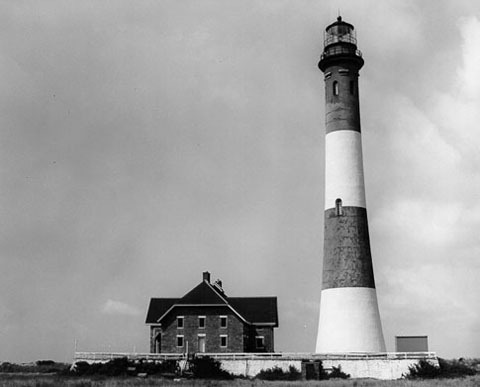 In 1960, Schubert accepted an assignment to the Coney Island Light as his family would finally be able to live with him at the station to which he was assigned. When interviewed by New York Times reporter, Mrs. Shubert explained “We’ve gone from one extreme to another. We never used to see Frank. Now he never leaves home.” Keeper Shubert’s duties included tending the light and the 1,000-pound fog bell. When he could no longer see Hoffman and Swinburne Islands, he would turn the bell on. In an emergency, or if the power went out, Schubert said that the fog bell could be hit “with a sledgehammer.” Schubert’s wife passed away in the late 1980s. When the station was automated in 1989, he was allowed to stay on as a caretaker, continuing to climb the 87 steps to the lantern every day to perform required maintenance duties. 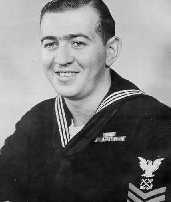 During his years of service, Shubert was credited with saving the lives of fifteen sailors and was invited for a visit to the White House by President George H. W. Bush. He and his dog, Blazer, remained on duty until December 11 of 2003, when Schubert passed away at the age of 88 as the last of the Coast Guard’s civilian lighthouse keepers. His lighthouse career had lasted 65 years, including the final 43 years at Coney Island Lighthouse. "The Coast Guard mourns the loss of its most courageous sentry of the sea," said Capt. Craig T. Bone, commander of Coast Guard Activities New York. "His devotion to duty and courage are unequaled." Photo shown is from June 12, 1961. See our Recent Additions page for more. I just returned from Paper Town, the book and paper show held in Boxboro twice a year. (next Boxboro show will be in September) Came back with a few items including this great 1911 Life Saving Service article in Leslie's Illustrated Weekly (see our Recent Additions page), a Race Point Coast Guard photo and a WWII vintage Coast Guard hat in original box. I enjoy the shows, seeing the dealers and chatting about the state of the business, etc., but they aren't like they used to be. What was once three large rooms packed with an estimated 125-150 dealers, in the last few years the show is down to one room, half full - the aisles are now twice as wide as they once were. The down side is that the internet has surely cut into the show's sales, and I am sure many aren't spending what they once did on their hobbies. The up side may be that this is a good time to buy prices have come down some and more early pieces are coming to the market as people convert their attic accumulations to cash. This may be a great time to add to your collection. There are book, paper, photo, etc. shows all across the country monthly - you may want to visit one in your area. The next good one in this area will be the Boston Book, Paper & Photo Exposition and Sale in Wilmington, Mass in May. Check out their web site. If you would like to comment on our Blog, or suggest a subject I will look for your notes on Facebook or you can email me. I look forward to hearing your suggestions and comments. Race Point Light Station, Provincetown, MA. 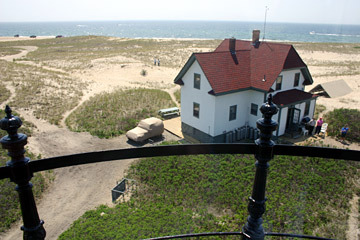 Race Point Light Station was leased to the American Lighthouse Foundation in 1995. Since then our organization has worked to restore the site - the keepers house has been repaired and modernized with heat, hot water, flush toilets, refrigeration, and a gas stove. Overnight stays were initiated in 1998. One of our efforts has been to institute the use of renewal energy sources on the site. A solar electrical system was installed in October 2003, and a wind turbine generator up was added in 2007, making the use of a diesel generator unnecessary. The restored whistle house was opened to guests for week-long stays in 2008. This year solar hot water was added to heat the potable water, and to supplement the heat. Presently we are able to offer up to five rooms for rent, with shared kitchen and bath facilities in the two buildings. We hope eventually to expand the rental season beyond the current May - October with the addition of the solar hot water heating supplement. 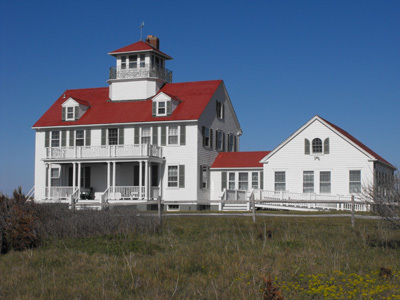 Race Point Lighthouse remains an active navigational guide maintained by the Coast Guard. Race Point is a wonderful place for a brief visit or for a stay - enjoy the quiet surroundings, learn about the history of the Lighthouse Service and of the outer Cape, and see renewable energy in action. 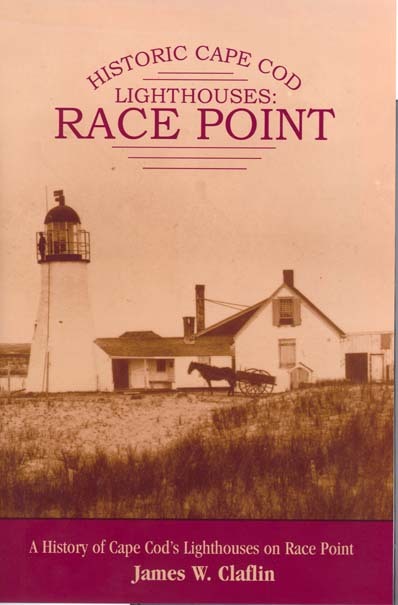 See the Race Point web site for more information on staying at the Race Point Light Station. 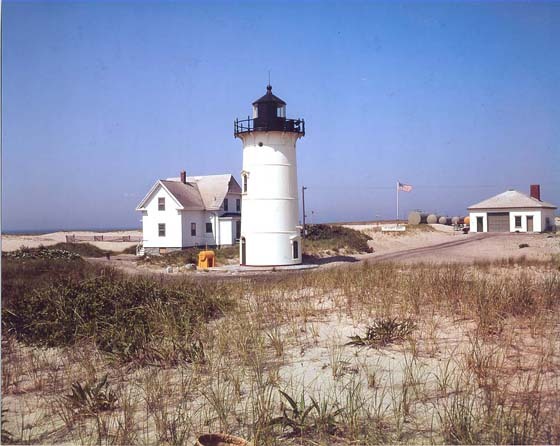 For more information on the history of the Race Point Light Station, check out our book HISTORIC CAPE COD LIGHTHOUSES: Race Point. A History of Cape Cod’s Lighthouse on Race Point. It is available for $8.95 here on our web site, or when you stay at the keeper's house at Race Point. 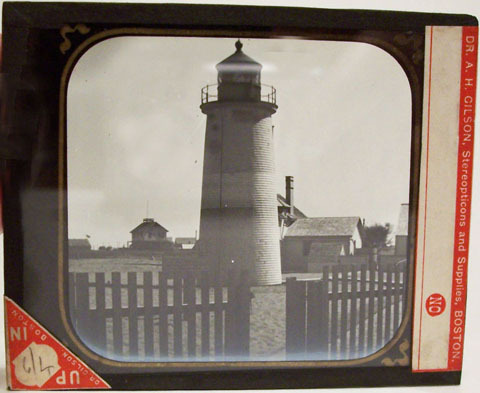 Check out also our Cape Cod Web Page for many more Cape Cod antiques and photos, books and more including this wonderful 42" panoramic photo of the Race Point Light Station. When in Wellfleet, be sure to check out the old Cahoons [sic] Hollow Life Saving Station. This is one of only two remaining U.S. Life Saving Service stations once located on Cape Cod's outer beach. The second remaining station, Old Harbor in Chatham, now resides in Provincetown at Race Point Beach, part of the Cape Cod National Seashore. The thirteen Cape Cod stations included Wood End, Race Point, Peaked Hill Bar, High Head, Highland, Pamet River, Cahoons Hollow, Nauset, Orleans, Old Harbor, Chatham, Monomoy, and Monomoy Point. On our U.S. Life Saving Service page we have hundreds of photos and antiques from these and other U.S. Life Saving stations. This service had an unprecedented record, saving hundreds of thousands of lives and vessels in its short forty five year span. In 1915, the U.S. Life Saving Service was combined with the U.S. Revenue Cutter Service to form the U.S. Coast Guard, which has continued the fine record of rescues, professionalism, sacrifice and service. One of my favorite places in Massachusetts is Cape Cod - particularly the outer Cape. The area boasts a maritime history hardly rivaled elsewhere, and the serene surroundings, particularly at this time of the year, are well worth the trip. View Cape Cod National Seashore, Web Cam image at Nauset Coast Guard Station, Eastham. We just got in a rare grouping of photos of the crews from this station taken in 1939 which we are offering on our Recent Items page. One of them is shown below - great detail. Station photos are more common (if I dare use that word), but we rarely find photos of the crews in action. A great group. 1. I suggest that you call us or email to check on availability of any item that you would like other than recent books. As items go quite quickly, please call and leave a message to reserve items that you would like. I will return your call, hold the items and await your letter or credit card information. We will also weigh the items and advise postage. 2. You may then call or email credit card information, or forward a check in the mail. Most items are mailed US Priority Mail or UPS. Additional information on our "Ordering Page". Page updated July 22, 2016 . We can help you find that needed book or item. All text and illustrations on web site Ó James W. Claflin . 07/22/2016 All rights reserved. Use prohibited without written permission.